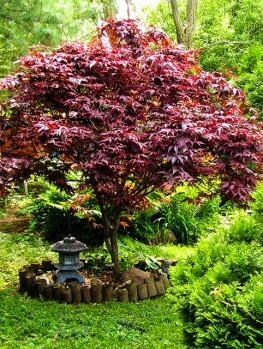 Long regarded as one of the best lace-leaf Japanese maples available, the Crimson Queen Japanese Maple is a beautiful small weeping tree that matures into a wide dome about ten feet tall and the same across. 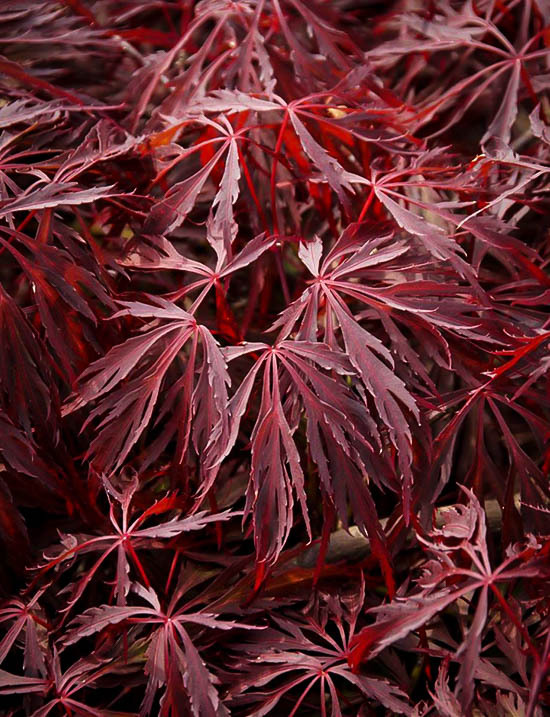 Its delicious dark-red foliage holds its color throughout the summer better than other red-leaf varieties. In fall it turns a richer red to brighten your garden as the seasons turn. 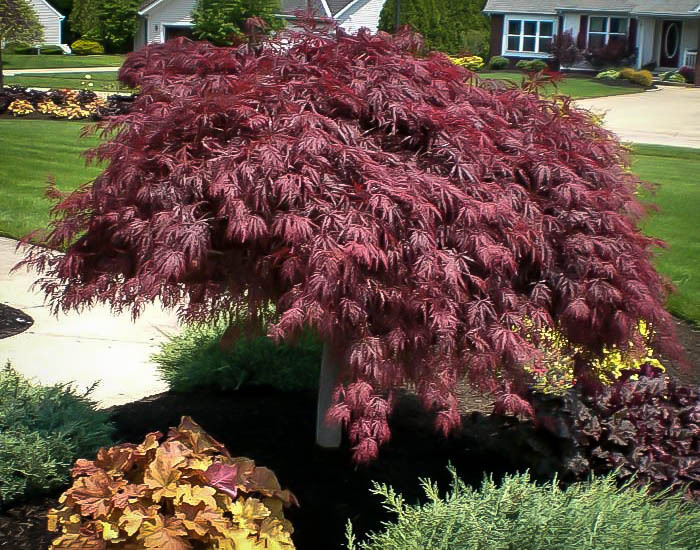 The Crimson Queen Japanese Maple will thrive in the shade of larger trees, or on the north side of your home, bringing grace and color from spring to fall. Remarkable for keeping its brilliant red all summer and never fading to muddy green, this is the pick of the crop for weeping form, compact habit and leaf color too. 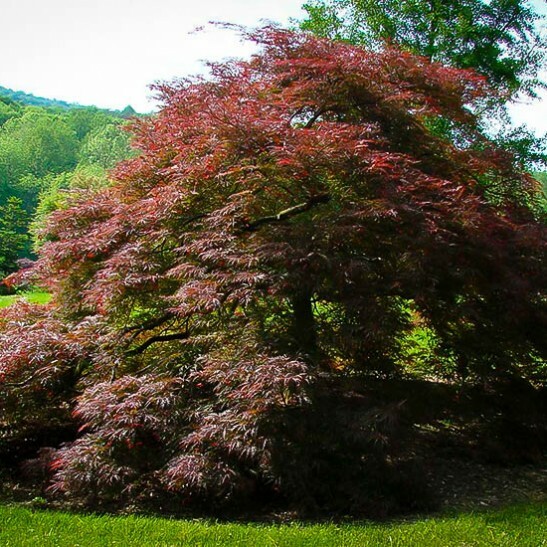 With so many different types of trees available to incorporate into your landscape, it can often be a daunting and even arduous task to choose the right one. Do you want evergreens for year round greenery, or a tree that can provide a multitude of color changes throughout the year? Do you need one that is large and dominating or one that can be accommodated by little space? There are many things to consider, and choosing the right tree is important to ensure it is suitable for their surroundings and will make a positive contribution to the appearance of your garden. 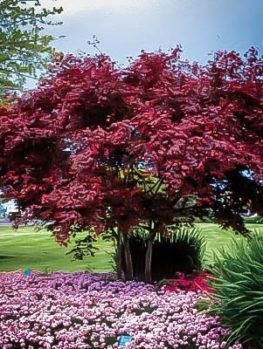 The Crimson Queen does not grow to an overbearing, making it an ideal choice for smaller spaces or gardens that need a touch of color to break up the monotony of too much greenery. 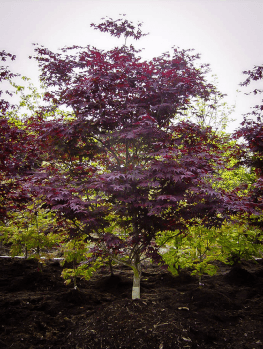 Even though Japanese maples are native to areas in China, Japan and Korea, the Crimson Queen originated right here in the United States in 1965 and has been a long time favorite among horticulturists for its small size and brilliant color. 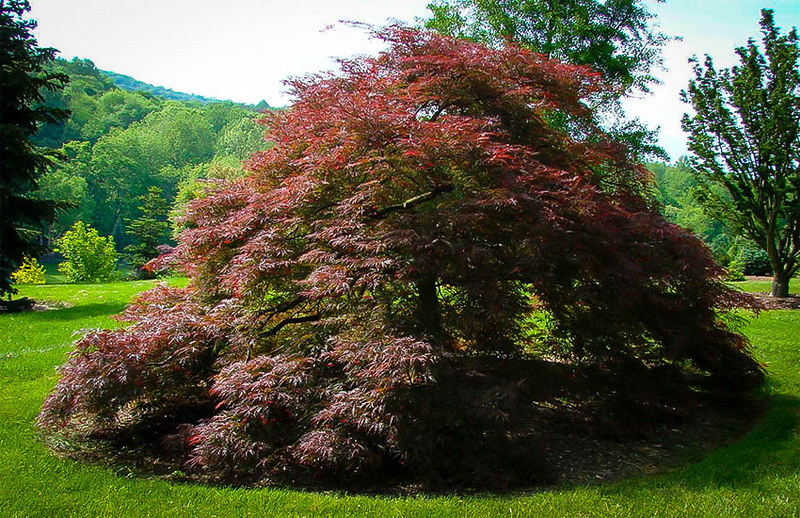 Considered to be both a tree and a shrub, this weeping dwarf maple can be utilized in many different ways. Staking the tree as a young plant will help it to grow more upright, and if trained like this it can reach up to ten feet in height. The crown has a wide diameter of nearly twelve feet at maturity. If you decide not to stake the tree it will grow lower to the ground, with the tips of its elegantly arching branches dangling just above the soil. The leaves are often described as being lace-like, with five to seven finger-like points on each one. The branches are densely packed and the Crimson Queen carries a very leafy appearance from spring through to late fall. New growth produces lovely green leaves with purple-tinged edges, along with small reddish-purple flowers which begin to show in April. Following the blossoms come winged samaras that ripen in late September to early October. As the seasons progress these turn to orange, yellow and then finally settle on a bright candy apple red in the fall. 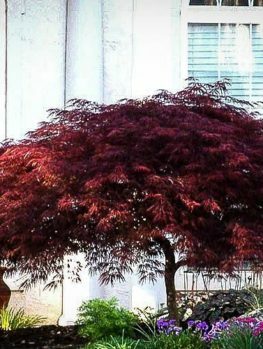 It will take between 10 to 20 years for the tree to reach its full mature height, and you will want to take this into consideration when choosing your preferred location for it in your landscape design. Crimson Queen is suitable for areas in USDA plant hardiness zones 5 to 8. It is capable of withstanding the cold snaps and snow found in the more northern states, as well as the heat and humidity of northern Florida and some parts of Texas. It is also moderately tolerant of drought conditions but you will want to adopt a regular watering schedule during the hottest months, especially when you will not be receiving a lot of rainfall. This shrub is highly adaptable to a range of soil types; loam, clay, sandy or chalky, although it’s happiest when the ground is neutral or acidic. Soil should be well drained but maintain a level of moisture that is adequate for the weather conditions. It can tolerate both full sun and partly shaded locations. If you are in one of the hotter parts of its range Crimson Queen will benefit from some shade to avoid leaf scorch from too much exposure. Colder areas that experience a lot of snow, ice or windy conditions will mean the tree needs to be sheltered, either by other plants around it or by situating it near buildings or tall fencing. If you keep this information in mind, choosing the right location for your Crimson Queen won’t be too difficult. Because of its versatility and adaptability, most locations are going to be suitable and should allow the tree to flourish. Caring for the Crimson Queen will depend on how you choose to grow it. 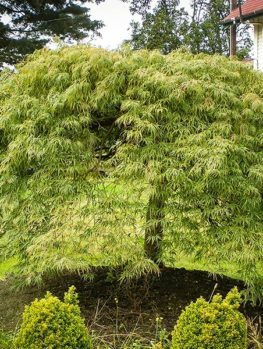 If you require it to be more upright and tree-like staking it will allow it to grow to its full height and display its wide weeping crown in its full glory. For use as a shrub staking won’t be necessary, as the tree naturally forms lower to the ground as it spreads out. The crown will still form just as beautifully. Use as either a tree or a shrub will not detract from its beauty. It is tolerant of pruning and this should be done when the tree is most dormant in the colder months. Fertilization should also take place in early spring before new growth appears. 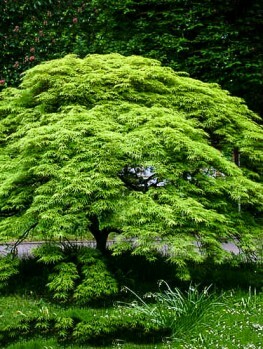 Like many other maple varieties, this species has no serious insect or disease problems. Add Beauty and Color to Your Garden! 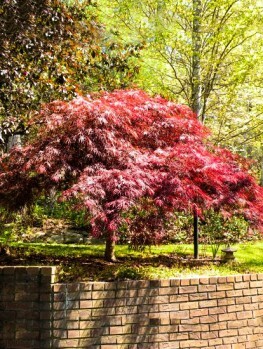 Both commercial and home landscaping will benefit from the addition of this beautiful and colorful tree. 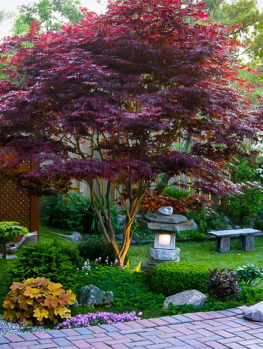 Whichever way you choose to grow your Crimson Queen Japanese Maple, it is guaranteed to be a strong color producer and a powerful focal point full of that visual attractiveness that many gardeners are seeking when constructing their ideal outdoor living spaces. The Crimson Queen is aptly named and will most certainly be a great investment.